Bands and music played an important role in the First World War—lifting the spirits of the soldiers and instilling pride in our armed forces. In a nod to the rousing service of army musicians, in 2015 the Queensland Services Heritage Band Association (QSHBA) fit out the Queensland Mounted Infantry Historical Troop Band (QMIHTB) in replica First World War Queensland Light Horse uniforms. Partnered with other re-enactment groups and organisations, this authentically presented marching band is now a living memorial and commemoration of the service of veterans of the First World War. 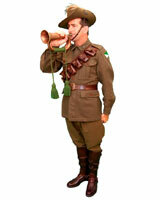 The band continues to participate in commemoration events over the Anzac centenary period, and beyond. QMIHTB is based in Brisbane and comprises of about 20 volunteers. These include musicians of all ages (from teenagers to sixty year olds) and from diverse backgrounds. The band is already in demand and has performed at community celebrations around the state, including the Ipswich Festival, Wondai Reserve Forces Day, Emu Gully, Caboolture Flag Day, Chermside "Shell Green" celebration, Howard Coal Festival, Fort Lytton, and Brisbane City Mall, and of course, Anzac Day. 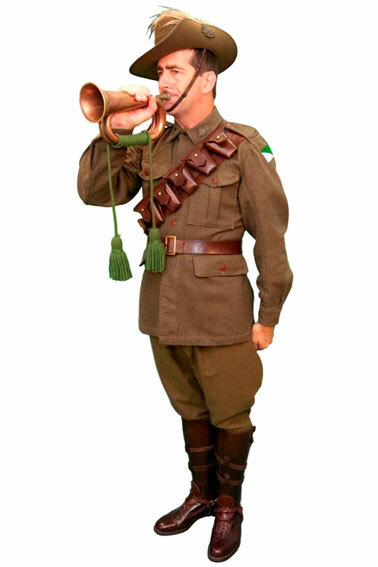 President of the parent organisation (QSHBA) Paul Smith believed the new authentic uniforms would raise the profile of the band even further in the community and increase opportunities for the band to contribute to Anzac centenary events and other significant occasions. “Through QMIHTB we aim to remember and maintain our military traditions. We believe it’s important to not only remember the music of the past but, also to look the part as well,” said Mr Smith. 2015 was a big year for QMIHTB with the centenary of the Gallipoli landings coinciding with the band’s 10th anniversary. During the year, Mr Smith said their experiences fostered ambitions to gain sponsorship that would enable them to travel. The new uniforms made their debut at the Wynnum Shangri-La Century of Heroes dinner on 17 April 2015.